New England has quite a history and being the oldest American colonies it has its share of waundering spirits. Pennsylvania is filled with old inns and hotels that house some of these lost souls. Located in the historic and picturesque downtown district of Bethlehem, the Hotel Bethlehem is both grand and ghost-friendly! 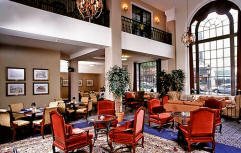 The historic district that surrounds the hotel dates back to the settlement of Bethlehem by the Moravians in 1741. So after over 300 years of existence, it’s little wonder that the area has accumulated some ghostly activity. However, it has only been relatively recent that the Hotel Bethlehem has officially embraced its haunted nature by offering “Rooms with a Boo.” We just love hotels that are sophisticated, yet can have some fun as well! Guests and staff report apparitions, cold spots, shadows and unexplained reflections in mirrors and glass. Some employees have heard their names called when no one is there, being tapped on the shoulder, and seeing pens drop on the front desk from nowhere. Other incidences include vacuums turning on and moving across the floor, even when they were not plugged in. So who are some Hotel Bethlehem’s ghosts? One of the ghosts is a little girl who appears in a window. Some believe she was once the owner’s granddaughter, May Yohe, who was raised in the hotel. She was a spirited young girl who loved to sing and dance for the guests. May later became a well-known actress and singer in the 1890s and acquired fame and fortune. However, her adult life wasn’t as happy as the childhood at the Bethlehem. She suffered scandals and broken hearts, eventually dying penniless. 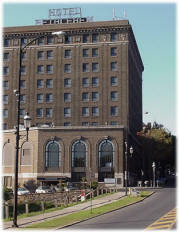 Perhaps that is why her spirit comes back to visit the place of her happy childhood...The Hotel Bethlehem. Another ghost reportedly is a woman in period dress appearing in the kitchen and then vanishing in the dinning room. A Friday night workshop on the basics of seeing Ghosts, where they are, how to see them and how to hear them! Bring your digital cameras and get ready for some paranormal fun! You won’t even need to leave the hotel. Saturday Morning Breakfast, as we hear from famous and fabulous, author, professor and Ghost expert, Katherine Ramsland. Take a Ghost Tour, as you tool around Bethlehem’s Historic District, explore the beautiful shops and restaurants, of course, they almost all have ghost of their own! Follow this self-guided tour, at your own pace, through two very different cemeteries as well as a revolutionary war burial ground, the final resting place for five hundred unknown soldiers! Don’t forget your cameras! Meet in the Tap Room at Midnight, for a complimentary brandy or bloody mary! Sunday Morning Brunch, share ghost stories as we take a look at what our amateur as well as professional ghost hunters came up with. The Farnsworth House Inn is located in a virtual vortex of ghosts – Gettysburg, Pennsylvania – the site known for being the bloodiest battle during the American Civil War. Built in 1810, the Farnsworth House was eyewitness to the infamous battle which took place in July 1863. Due to the enormous amount of lost lives, Gettysburg is believed to be home to many a restless spirit. 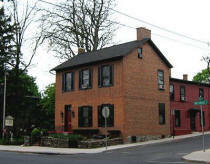 Today, the Farnsworth House Inn can still feel its fair share of Gettysburg’s ghosts. The Farnsworth House was named after Union Army Brigadier General Elon John Farnsworth (left), who along with sixty-five of his men perished in the battle at Gettysburg. Ghostly and paranormal events occur in the main house as well on the grounds of the Farnsworth House. It is rumored that there are fourteen spirits in the Farnsworth. However, the hub of ghostly activity seems to come from the Jennie Wade room. Jennie Wade (right) is known for being the only civilian killed in the battle at Gettysburg. Jennie was only twenty-years old when a Confederate soldier, who was housed at the Farnsworth, accidentally shot and killed Jennie. She was struck by a single bullet that traveled through two wooden doors. Funny thing, it isn’t even Jennie who haunts her namesake room, but a ghost named Mary. However, to commemorate her Jennie Wade, a room (below) was named after her at the Farnsworth House. 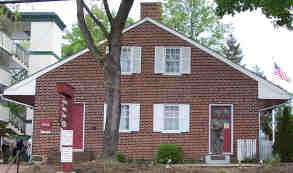 Jennie’s spirit is known to haunt her old residence, now called the Jennie Wade House (left), located less than a quarter mile from Farnsworth. To note, the Jennie Wade room at the Farnsworth House Inn is not to be confused with the Jennie Wade House! So what goes on in the Jennie Wade room? A guest once reported video camera batteries being drained while it panned across Jennie’s portrait in the room...twice! When the first battery pack died, a new fully charged battery pack was put in, and as the video camera panned again, the batteries were drained completely. Other activity included a distinct feeling of something “brushing” against their neck, doors opening by themselves, unexplained smells, and unexplained voice of a child. The Farnsworth House Inn has been called "one of the most haunted inns in America" by the Travel Channel. So for fun and to attract ghost-loving guests, the Farnsworth offers the Mourning Theater. Located in the inn’s basement, guests have to descend a stone staircase where they will enter a 19th Century "Funeral Parlor" for a one hour presentation, and view the unique collection of Mourning Memorabilia. Sounds like a blast! Also, they offer Candlelight Ghost Walks. At its gift store, Beyond the Veil, you can purchase A&E/History Channel’s "The Unexplained" (right) which showcases the Farnsworth House Inn as the 7th most Haunted Inn in America - or through Amazon.com. Interested in the ghosts of Gettysburg or more about Jennie Wade, the books below are a wonderful source of information.